New Golf Carts! Includes a manufacture warranty. Horsepower depends on the make and model of the cart. E-Z-GO 2012 +, 13 horsepower. Yamaha, 11 horsepower. Most are 48 Volt Batteries. A few carts may have 36 Volt Batteries. 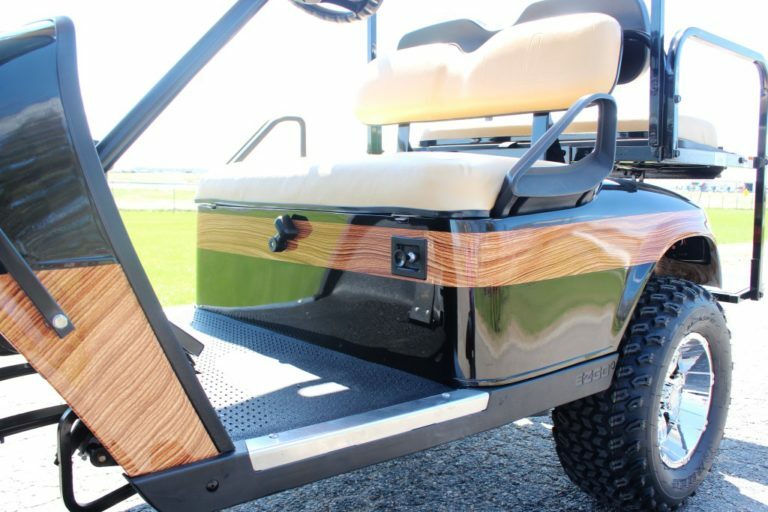 Accessories Can Be Added to Your Customized Golf Cart! Horsepower depends on the year, make and model of the cart. E-Z-GO 2012, 2013, 2014, 2015, 2016, 2017 have 13.5 horsepower. Yamaha has 11 horsepower. Generally speed is around 11 – 15 MPH. Speed is Approximate And May Vary On Size Of Tires & Wheels. Most have a Universal Key. Complete Inspection & Fully Serviced – Oil Change, Air Filter, Spark Plug, Fuel Filter, Tire Alignment. Some Models Have a New Clutch Installed. Street Use Depends on Your City, County or State – Contact Your Local Department of Vehicles. Used Custom Golf Carts in Stock Will Vary From Yamaha, E-Z-Go and Club Car. 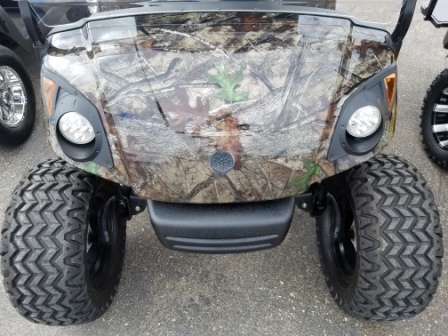 We Have Access to a Large Supply of Golf Cart Accessories to be Added to Your Customized Golf Cart!Besides the golf course, used golf carts are good for around the yard, cabin, camping, vacationing, utility, farm or small errands around town (street legal use may vary from county to county). 169.045 SPECIAL VEHICLE USE ON ROADWAY. Subdivision 1.Designation of roadway, permit. (3) a utility task vehicle means a side-by-side, four-wheel drive, off-road vehicle that has four wheels, is propelled by an internal combustion engine with a piston displacement capacity of 1,200 cubic centimeters or less, and has a total dry weight of 1,800 but less than 2,600 pounds. The ordinance shall designate the roadways, prescribe the form of the application for the permit, require evidence of insurance complying with the provisions of section 65B.48, subdivision 5and may prescribe conditions, not inconsistent with the provisions of this section, under which a permit may be granted. Permits may be granted for a period not to exceed three years, and may be renewed. A permit may be revoked at any time if there is evidence that the permittee cannot safely operate the motorized golf cart, all-terrain vehicle, utility task vehicle, or mini truck on the designated roadways. The ordinance may require, as a condition to obtaining a permit, that the applicant submit a certificate signed by a physician that the applicant is able to safely operate a motorized golf cart, all-terrain vehicle, utility task vehicle, or mini truck on the roadways designated. Motorized golf carts, all-terrain vehicles, and utility task vehicles may only be operated on designated roadways from sunrise to sunset, unless equipped with original equipment headlights, taillights, and rear-facing brake lights. They shall not be operated in inclement weather, except during emergency conditions as provided in the ordinance, or when visibility is impaired by weather, smoke, fog or other conditions, or at any time when there is insufficient visibility to clearly see persons and vehicles on the roadway at a distance of 500 feet. Motorized golf carts shall display the slow-moving vehicle emblem provided for in section 169.522, when operated on designated roadways. The operator, under permit, of a motorized golf cart, all-terrain vehicle, utility task vehicle, or mini truck may cross any street or highway intersecting a designated roadway. Subd. 6.Application of traffic laws. Every person operating a motorized golf cart, all-terrain vehicle, utility task vehicle, or mini truck under permit on designated roadways has all the rights and duties applicable to the driver of any other vehicle under the provisions of this chapter, except when those provisions cannot reasonably be applied to motorized golf carts, all-terrain vehicles, utility task vehicles, or mini trucks and except as otherwise specifically provided in subdivision 7. Subd. 7.Nonapplication of certain laws. The provisions of chapter 171 are applicable to persons operating mini trucks, but are not applicable to persons operating motorized golf carts, utility task vehicles, or all-terrain vehicles under permit on designated roadways pursuant to this section. Except for the requirements of section 169.70, the provisions of this chapter relating to equipment on vehicles are not applicable to motorized golf carts, utility task vehicles, or all-terrain vehicles operating, under permit, on designated roadways. Subd. 7a.Required equipment on mini trucks. In the event persons operating a motorized golf cart, utility task vehicle, all-terrain vehicle, or mini truck under this section cannot obtain liability insurance in the private market, that person may purchase automobile insurance, including no-fault coverage, from the Minnesota Automobile Insurance Plan under sections 65B.01 to 65B.12, at a rate to be determined by the commissioner of commerce. Hydro-Graphics, also known as immersion printing, water transfer printing, water transfer imaging, hydro dipping or cubic printing, is a method of applying printed designs to three-dimensional surfaces. There are thousands of patterns to choose from. 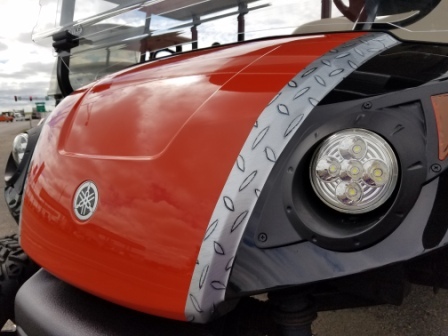 We work with local dealers who precisely apply Hydro-Graphics to a select few of our custom golf carts. Contact Us to learn more about your options or pricing. Whether it’s your first time snowmobiling or you’re a seasoned pro we will have the inventory for you to choose from, giving you the time to keep your eye in the sky for that snowflake! Every state or province requires that your snowmobile be properly licensed or registered. Licensing requirements for driving a snowmobile vary from state to state or province to province, and that information is available from your state. Also – some areas require a snowmobile safety class – it’s best to check within your area. Discuss your snowmobile preferences with Winter’s Rec to determine the best option for you and you’re snowmobiling needs. Here you’ll some websites to help you set off on your snowmobiling journey in the United States. You’ll find links to hotels and lodging, official tourism websites and information on snowmobiling found in many states, provinces and territories. Now put on your helmet and browse some websites – it will be a great way to get you in the mood for your upcoming adventure. One of our favorite destination spots for snowmobiling would be Togwotee Mountain Lodge! Located in Jackson Hole, WY, they are winter sports enthusiasts who have a deep appreciation for Togwotee Pass, Bridger-Teton, Continental Divide, and Yellowstone National Park. Their “backyard” is incredibly special and they will inspire you to enjoy the national parks and forests. If you are looking for winter adventures, this is the place. They offer day tours, as well as overnight trips to multiple destinations in Yellowstone National Park. They also offer several breathtaking tours of Bridger-Teton National Forest, including single day and overnight excursions. Their Bridger-Teton National Forest tours include Granite Hot Springs, the Gros Ventre wildlife viewing tour, the historical Brooks Lake Lodgetour, the Continental Divide snowmobile tour, Greys River tour, and a variety of off-trail powder tours. Whether you’re a family with kids or an aggressive powder hound, we have the perfect tour for you. Togwotee Mountain Lodge and Togwotee Adventures are Permitees of the National Park Service and the Bridger-Teton National Forest. We have 3 locations! Winters Recreation (Formerly Centre Motor Sports) main office is located in Central Minnesota – Sauk Centre. What is Motor Sports or Power Sports? 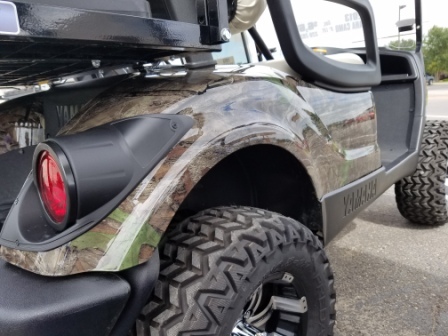 Centre Motor Sports LLC, DBA Winters Recreation cannot be held responsible for misuse of a purchase that could result in bodily injury or even death. It is the responsibility of the purchaser to follow and abide by the safety guidelines during operation. As the consumer, you agree to take full responsibility for the operation of your motor sport and not hold Winters Rec responsible for any misuse or handling that could result in bodily harm or death.